Alternative AA4070 Ladies Long-Sleeve Crew is one of the best ladies crew t-shirt. 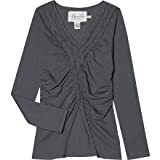 Alternative AA4070 Ladies Long-Sleeve Crew is available in wide range of colors; very strong fabric and soft to wear.100% cotton jersey; scoop neck; ribbed set-in collar with neck tape; garment washed. Alpinestars develops world-class technical apparel and footwear for all forms of motorcycling, auto racing and action sports as well as offering a large range of stylish casual clothing. Founded in 1963, Alpinestars has built a reputation of innovation and prestige. Now, fifty years later, Alpinestars is synonymous with quality, protection, technology and style. 94% preshrunk ringspun cotton, 6% organic cotton; generously cut; seamless rib at neck; double-needle stitching on front of neck and bottom hem; shoulder-to-shoulder tape; rib knit cuffs.